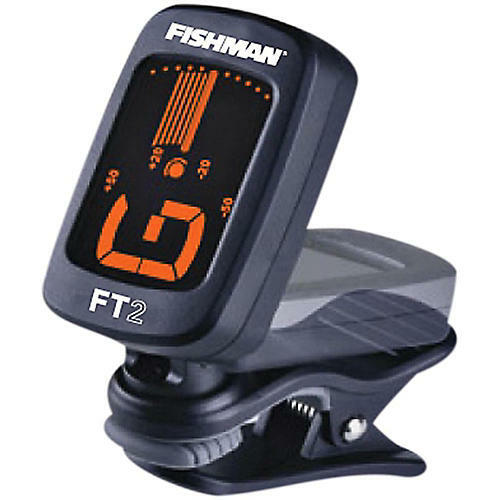 The Fishman FT-2 digital chromatic tuner provides quick and accurate tuning for most instruments with a simple flip. Clip it on, flip up the display and the FT-2 powers-on. Flip it back down after you're done tuning to shut it off. The large, high-contrast, backlit display is easy to read and shows pitch with ±1 cent accuracy via tuning needles and a multi-color backlight. It is also incredibly lightweight, weighing only 21 grams, so it won't affect your instruments tone. When flipped down to the off position, its very low profile, so you can leave it in place while you're playing and the soft clip is safe on most finishes.